As I was planning for the next school year, I was thinking of having Donnie read The Light and the Glory for Children as well as the other books in the series. So, I typed them up notebook style. I am happy to share them with those of you who plan on using this book in your studies also. Funny thing though, the past week or so, I have felt the leading to have us all learn Bible History. So, I am now researching this. 🙂 I have always wanted to dig deeper into Bible times, so I am excited. 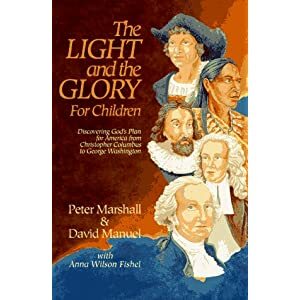 You can find The Light and the Glory by Peter Marshall and David Manuel at Amazon or Christianbook. You are very welcome Abbi. Enjoy! Thank you for taking the time to create and then share these worksheets! They are a perfect compliment to our chapter studies. Cheryl, it is my pleasure. are these questions still available? I'd love to have them! Hi Jordan. Yes they are still available. I fixed the link. Enjoy! God Bless you sweet lady for doing this and sharing it. You did a beautiful job. I LOVE "clean" looking worksheets that are easy on the eye. Aw, thank you Shelah! That means a lot! Blessings to you too! Sure thing Liz! 🙂 Enjoy. Thank you for sharing! I was just about to type up those questions and found your site. I really appreciate your hard work!! Hi Christy. I am so glad you found me before you typed up the questions. It is my pleasure. Enjoy! Whew! You just saved me so much work - thank you so much!!! I am so glad to hear that! Thanks for taking the time to let me know. 🙂 And, you are very welcome! Awesome layout! Do you have the answers for the questions? Thanks so much for sharing your hard work. Can't wait to print this out for my kids! You didn't happen to make these for the other two books in the series did you? Just hoping. This is great! It always is great to find helps when we homeschool! You are welcome Kerrie! Enjoy! thank you soooo much for these questions. my daughter is reading this, this year and I just googled to see if there were any questions that someone took the time to post! You are a true blessing! This is absolutely fantastic; I have "From Sea to Shining Sea" so this will be a huge bonus!! Thank you for all that you do and share.